In 2009, Bristol Bristol’s Floating Harbour marked its 200th anniversary with a number events and activities. Local Journeys contributed to these celebrations by working with schools and artists and through them I devised and delivered a photographic project for students on the highly regarded AS Level photography course at St Mary Redcliffe 6th Form college, led by enthusiastic teacher Sharman Jupp. We took the students on a tour of the docks with their cameras, travelling on foot and by ferry between Prince Street and Temple Meads, learning of its history, and current development en route. They also visited the Industrial Museum (now part of MShed) where curator Andy King showed them some of the archive photographs of the working docks from the last 170 years, as well as a collection of vintage cameras. After the initial tour students were encouraged to conduct their own research and visit the docks to photograph in their own time, and to consider a number of themes as they did so, for example the range of goods that moved in and out of the docks; the varied dock-related structures that can be found – from medieaval to modern; the contrast between the current status of the docks as largely a leisure facility and its previous importance as an industrial location. As part of the project the students were also asked to consider a range of options for presenting their images, and part of the workshop process included looking at artists’ books and similar artefacts. 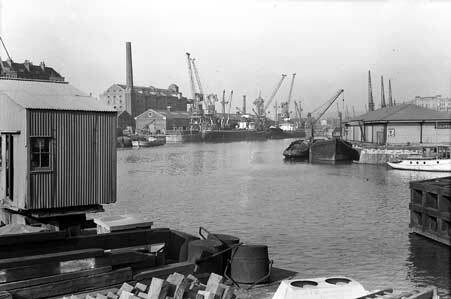 Over a term the students produced photography-based work of a very high standard, which they exhibited in the Benjamin Perry Boathouse on Phoenix Quay – a late C19th timber building central to the area they had been investigating. Their exhibition was later transferred to the offices of Osborne Clarke on Temple Quay. To view individual work by students please visit the Local Journey’s flickr page for this project. This entry was posted in Artist's books, Design, Photography / arts workshops, Place, Urban projects, Work and tagged Bristol, MShed. Bookmark the permalink.